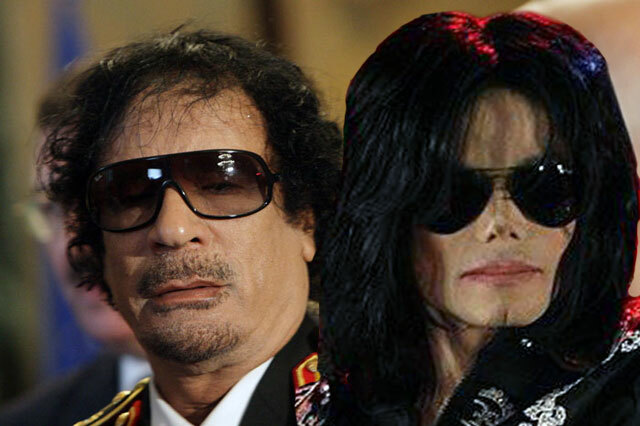 Am I the only one that thinks Muammar al-Qaddafi and Michael Jackson look like the same person? I mean, add 20 pounds and a limp and you’re basically there. Oh and a pulse. And a crack team of lady bodyguards. Really. MQ? Sleeps in a tent. MJ? Slept in a tent. Face like wood putty? Check. Rambling conspiracy theories, a love for costumes and radical decisions prompted by financial troubles? Check, check and check. Two men, two vast reservoirs of ego and paranoia swirling around in big piles of money, leaking weird gibberish across the land. Only natural that they’d have the same tailor, eh? But what if it was more than that? What if Michael Jackson, hounded by his debts and public reputation, entered in a secret pact with mysterious Libyan nationals to support a clandestine coup, a neat little switch that whisked the real Qaddafi off the pedestal and slid the ersatz dictator in his place as smooth as Indy swaps idols for sand? A plausible Michael Jackson corpse wouldn’t be the hardest thing in the world to fabricate and Qaddafi’s strange reputation could be cited to cover up any unaccounted for behavioral changes. Now, I’m not saying this did happen. I’m just saying for a man as weird and famous as Michael Jackson, there aren’t nearly enough rumors and conspiracy theories surrounding his death. We can do better, people. Give the King of Pop his Elvis treatment. Let’s start reporting Michael skulking around the dumpsters behind Costco at 4 am, breaking open expired boxes of over the counter allergy medicine. Let’s convince each other he ascended into heaven astride a chimpasus, an immortal hoofed and winged primate developed by freakiest of Soviet science in a Kazakhstan lab. WE CAN DO BETTER.